Indeed, this holy season again reminds us that out of death and loss there is the emergence of new life. As a child, I loved going to visit the old Oregon Forestry Center that was located near the Montgomery Ward building in Portland, Or The building was a colossus. The structure was built like a huge log cabin. When you walked into the entry way, you noticed huge Douglas Fir Tree trunks that literally supported the roof. For me, as a child, walking to the forestry center was like walking into a big cathedral-this one being dedicated to nature. The cabin was one of the last two surviving building from the 1905 Lewis and Clark Exposition in Portland*, and it sat across the road from Montgomery Park in the northwest section of town. It was an enormous structure, measuring 206 by 102 feet – just shy of half an acre. A full million board feet of lumber went into it. Portland timber magnate Simon Benson — the fellow who installed the famous “Benson Bubbler” drinking fountains in downtown Portland — supplied most of the logs for the structure, and they were hand-picked old-growth monsters from Columbia County. There was a colonnade down the middle of the building, made of 52 unpeeled six-foot-thick tree trunks, hand-matched like a string of pearls. They’d had to be handled specially when they were cut and hauled, to preserve the bark. Then all of a sudden in 1964 an electrical fire started in the Forestry Center due to ancient wiring and the entire structure went up in flames. The building was a total loss. The city of Portland mourned because of the loss of this building. Many years later I would see Notre Dame Cathedral in Paris. Like seeing the Oregon Forestry Center, I was captivated and mesmerized by the beauty of this Gothic Cathedral sitting on an island in the middle of the Seine River in the heart of Paris. Notre Dame has lasted for over 850 years. Kings have been crowned there, a huge memorial service for President Franklin D. Roosevelt was held there April 16, 1945. Victor Hugo was inspired by the cathedral to write The Hunchback of Notre Dame. 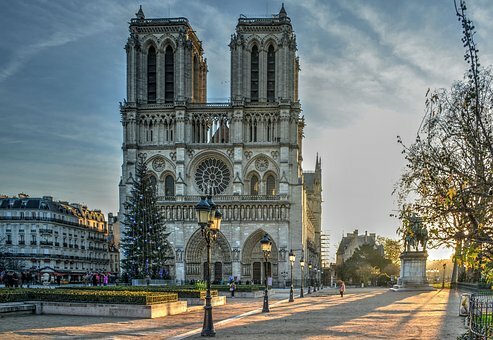 Notre Dame is not only the Catholic cathedral of Paris, but it is a world treasure. Right now, Parisians, France, indeed all of the world has sustained a devastating loss. If I were Pope Francis, I would be in Paris now. People are grieving, they are feeling the loss not only spiritually but culturally. During such times of crisis, a shepherd needs to be with their flock. Imagine the sight of the Holy Father celebrating Easter mass in front of the surviving bell towers on the cathedral plaza. What a powerful sight and powerful message that would convey to all. May that indeed come to all of us, to Paris and to all the world again and again.